Make your way through danger-filled landscapes toward a rumbling volcano. "Rescue Team 5 continues the adventures of a great Time Management series. 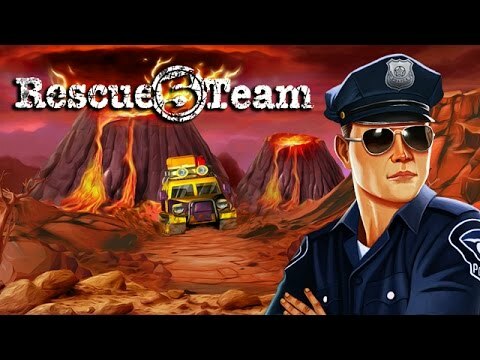 If you have played any of the previous four Rescue Team games, you will not be disappointed. Packed full of adventure, the Rescue Team's main objective is to save people and animals so they can return to headquarters. The team must remove obstacles to clear the road, rebuild buildings, build bridges, and send out fishing boats and helicopters to save stranded people. Once you start playing you will not want to stop." Join the world famous Rescue Team and set off on an adventure you'll never forget. Work quickly to remove the obstacles that stand in your way, rebuild ruined infrastructure, and free those in danger. As you make your way through a desert wasteland, snow-capped mountains, and a danger-filled jungle, you'll earn over two dozen achievements that bear witness to your heroism. Can you reach the foot of a rumbling volcano and save the day in the explosive finale? This game makes you concentrate and helps take your mind off of your daily thought. It's a very addictive game. I have played all Rescue Team games. The only draw back is that I wish there were more of them. Careful -- this one moves fast! It is not difficult to get the gist of how the game works, but it will take all your attention. I am happy to have it.